If there is one thing that can immediately let down a new self-build it is the look of the windows. Ask any self-builder what they would have done differently from the design point of view six months after they have moved in, and a very large number will immediately say: “the windows”. They are critical to the design — and the most difficult factor to get right. What is more, many architects will say that it is not until you stand back and look at the finished job that you will be absolutely – and finally – sure that the windows are ‘right’ for the building. Even more infuriatingly, it does not need the trained eye of an architect or a designer to take a quick look at the façade of a new house – of whatever style – and spot that the windows look out of place. Ask any architect and he or she will say the key to this is balance and proportion. Another word architects like to use is ‘disposition’ — making sure window openings are correctly lined up and that the relationship of solids to voids is neither too wide nor too narrow. So whether you are building a sharp, crisp modern ‘box’ with plain, unadorned window openings punched into it, or a house in classical style with a delicately proportioned façade, it is vital to pay the utmost attention to the window openings. If you get them wrong it can ruin the look of the entire project. Here are a few more pointers to help the would-be self-builder in either contemporary or traditional style when considering the tricky subject of window openings and surrounds. Window openings that are simple rectangular holes punched in a wall with no surrounds can be very effective. But in order to be ‘right’ they must have conviction, and there is just as much design skill needed as in a reproduction Classical building. 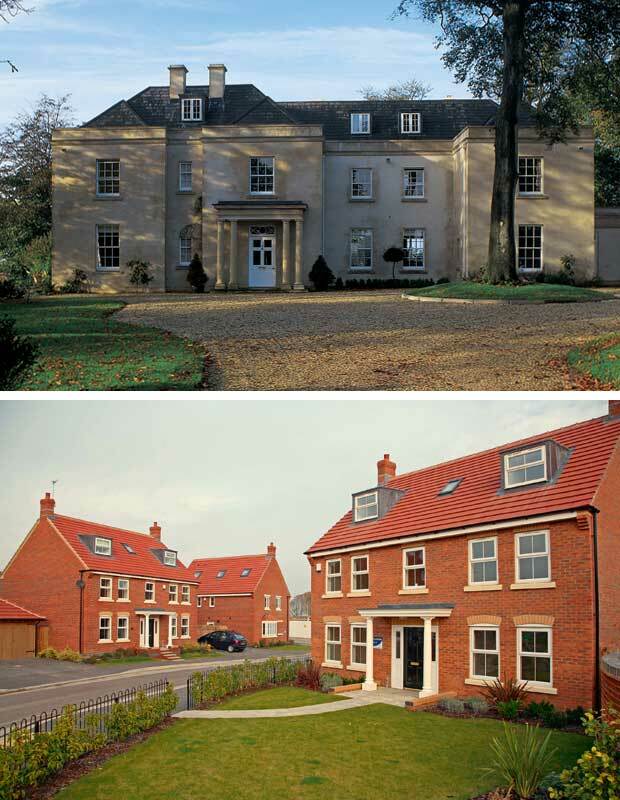 It is all to do with scale, proportion and detailing, and just because your house is built in a contemporary style, it does not mean that the proportions of the windows to the façade as a whole do not have to be architecturally correct. With contemporary house design there is a great emphasis on the asymmetrical, but even if you have contrasting vertical and horizontal openings in the same façade there has to be some sort of balance. Most experienced architects will use the so-called ‘Golden Ratio’(see below) as part of their design armoury if they want to be sure it is aesthetically pleasing. You should be especially careful if you are planning window openings with lintels that do not line up. If they do not relate to the floors inside the building, the openings can look as if they have been ‘thrown on’, rather than carefully designed into the façade. The window proportions can be extremely difficult to get right on a modern house reproducing Classical style. It is vital to make sure they do not appear ‘short and wide’ as opposed to ‘tall and thin’. There is great pressure on architects and designers to do this nowadays because the Building Regulations demand that windows must be at least 800mm up from the floor and there is constant pressure from planners to keep roof heights down. One way round this is to use horizontal rather than vertical sliding sashes. They can be useful to overcome the ‘squashed’ look because although the openings and frames are horizontal, the proportions of the sashes are vertical and can be the same as those on other storeys. A good rule of thumb in a house with smallpane sash windows is to try to keep the openings and the panes in approximately the same ratio. If you get that right, the façade should automatically look good. If you are building in Georgian style, remember that the sliding sash window frames would have been flush with the outer wall in the early Georgian period and rebated within the wall and therefore set back after 1774, when new fire legislation demanded this. In many cases, window frames set flush with the wall in houses rendered on the outside built to replicate timber framed 17th and early 18th century styles will have decorative mouldings around them to cover the joint with the render. As ever with house design, getting these details right pays off in the overall effect. Classical architecture has its roots in mathematics and the most obvious example of this is the ‘Golden Ratio’ (also known as Golden Mean or Section), a formula devised in 300BC by the mathematician Euclid. The Golden Ratio consists of two quantities (1 and 1.168). The ratio between the sum of those two quantities and the larger one of them is the same as the ratio between the larger one and the smaller. In architectural terms this takes the form of the Golden Rectangle, where the ratio of the shorter side to the longer is 1:1.618. Put simply, human beings are most pleased when things are in a proportion of 1 to 1.618 — i.e. if a window is one unit wide, it should be 1.618 units tall. 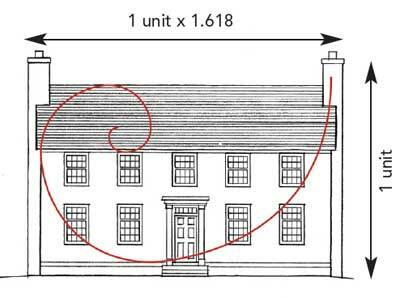 It’s not just used in windows — the ‘ogee’ curve used today in mouldings is a derivative of the Golden Ratio. The front elevation of this Georgian home (above) is drawn based on the proportions of the Golden Ratio, which determines its width, height, window positions and sizes, and the relative size of the roof pitch. An ogee curve – the quintessential Classical pattern and a derivative of the Golden Ratio – is overlaid. The window surround in a classical house varies enormously according to the style. If you are building in stone it is very common to pick out the windows in ashlar, or if the walls are rendered, with a finer contrasting render, with a stone surround to finish it off. 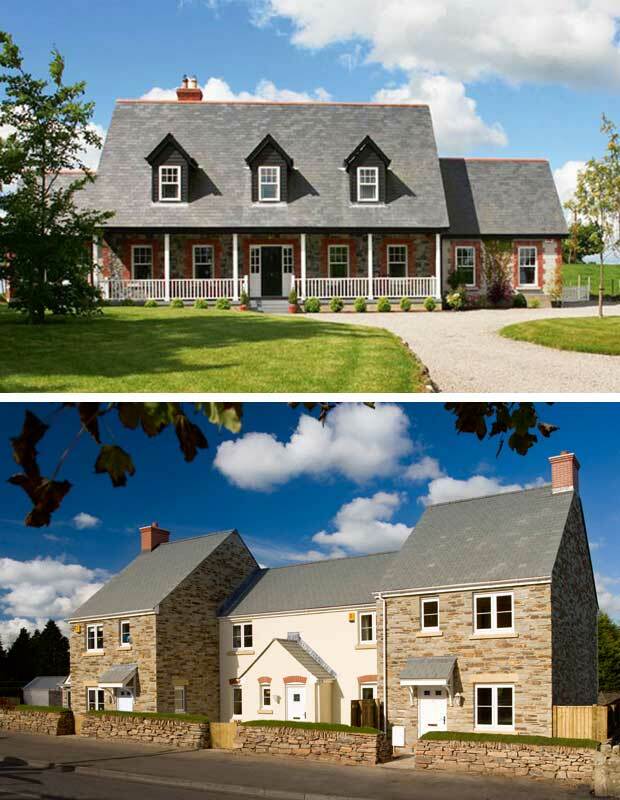 In this case, the effect of light and shade on the front façade will be much improved if you bring out the stone surround 20 or 30mm beyond the render.